From It's All PoliticsLike business in general, politics is not a spectator sport. You cannot afford to be apolitical at work if you have any aspirations for advancement. The only way to avoid politics is to avoid people--by finding an out-of-the-way corner where you can do your job. Of course, it's the same job you'll likely be doing for the rest of your career.In any job, when you reach a certain level of technical competence, politics is what makes all the difference with regard to success. At that point, it is indeed all politics. Everyday brilliant people take a backseat to their politically adept colleagues by failing to win crucial support for their ideas. Sometimes politics involves going around or bending rules, but more typically it's about positioning your ideas in a favorable light, and knowing what to say, and how and when to say it....Keep in mind that people benefit from perpetuating the image of politics as something you either know or you don't. Ignore them. Political acumen is largely learned from observation. And then it's a matter of practice, practice, practice. When a journalist suggested that golfing great Gary Player was very lucky, he replied: "It's funny, but the more I practice, the luckier I get." 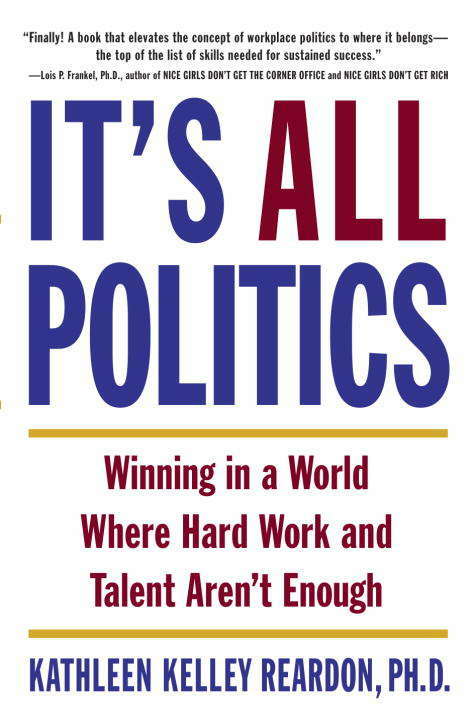 The same is true of politics.An indispensable guide to mastering the ins and outs of office politics--the single most important factor in getting ahead in your careerAs management professor and consultant Kathleen Reardon explains in her new book, It's All Politics, talent and hard work alone will not get you to the top. What separates the winners from the losers in corporate life is politics.As Reardon explains, the most talented and accomplished employees often take a backseat to their politically adept coworkers, losing ground in the race to get ahead--sometimes even losing their jobs. Why? Because they've failed to manage the important relationships with the people who can best reward their creativity and intelligence. To determine whether you need a crash course in Office Politics 101, ask yourself the following questions:Do I get credit for my ideas?Do I know how to deal with a difficult colleague?Do I get the plum assignments?Do I have a mentor?Do I say no gracefully and pick my battles wisely?Am I in the loop?Reardon has interviewed hundreds of employees, from successful veterans to aspiring hopefuls, examining why some people who work hard and effectively at their jobs fall behind, while those who are adept at "reading the office tea leaves" forge ahead. Being politically savvy doesn't mean being unethical or devious. At heart, it's about listening to and relating to others, and making choices that advance everyone's goals. Like it or not, when it comes to work, it's all politics. And politics is all about knowing what to say, when to say it, and who to say it to.